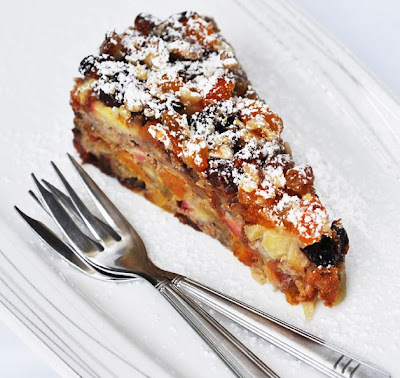 This cake has been inspired by the Apple Pie with Dried Fruit from the Mansurovs. I baked their version when we had guests for a BBQ, and it was a true success. What I love about this cake is that the fruit are really the main ingredient. The flour egg mixture just holds it together. Two days later I baked it again, trying to make it a little healthier, replacing sugar by adding more dried fruit, by using whole wheat flour only, and by substituting olive oil for butter. It turned out really well. The cake was eaten and finished as fast as the original. Preheat oven to 175C. Line a spring form with parchment paper or coat with butter/oil. In a bowl, combine all dried fruits. They should have about the same size. Chop bigger pieces. Pour boiling water over the dried fruit until just covered and let stand for 10 minutes or until fruit are plump. Drain and set aside. In another bowl, combine flour, baking powder, salt and cinnamon. Mix well. Beat the eggs lightly. Add the oil and stir until combined. Add wet ingredients to dry ingredients until just combined. Quarter the apples. Cut each piece into fine, small slices. Chop the walnuts. Keep 3 tablespoons aside. Stir the apples and remaining walnuts into the batter. Keep 1/4 cup of drained dried fruit aside. Stir in the rest into the apple walnut batter mixture until well combined. Pour the batter into the spring form. Sprinkle the remaining walnuts and dried fruit on top. Bake for 45-55 minutes. Let cool for 15 minutes before opening the spring form. Serve warm or cold. I highly recommend it warm with vanilla ice cream.